In the Gambia, Humanity First have been assisting selected families for a period of six months, and where possible, also providing them with ancilliary services to improve their health and training, thus enabling them to become self-sufficient after that period. Humanity First has a modest programme of orphan care in the country. HF is looking after 10 orphans on a long-term basis. The Gambia lies either side of the river Gambia so you might expect that water is freely available. However, the villages rely on aged hand-pumps for clean and safe drinking water, and many of these pumps have fallen into disrepair. Only 35% of the rural population of Gambia has access to decent water and sanitation and even in urban areas, that figure is thought to be just over 40%. Humanity First has been reinstating these pumps and also training local staff to continue the maintenance longer-term. Humanity First has established 4 IT training centres in the country and over 4,400 students have already graduated with a range of IT diplomas and qualifications that are helping them to attain jobs in the civil service and private sector. 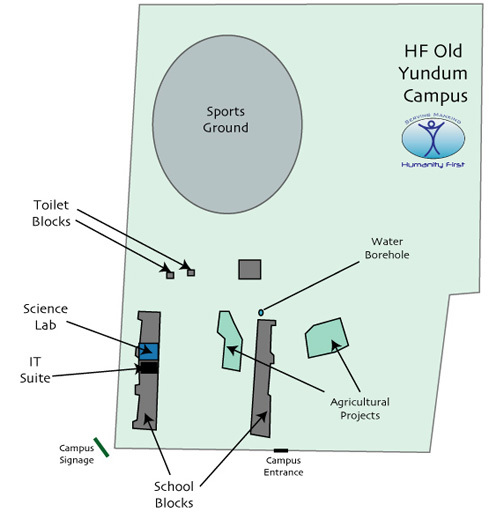 Humanity First has taken on an ambitious project in The Gambia to build a large secondary school on 10 acres of land donated by the Government in Old Yundum. The school opened in 2005 and has already become very popular for further education. There is a staff of 26 including 20 teachers running a double shift system to cope with demand. By the end of 2008, there were 696 students consisting of 405 boys and 291 girls. The first batch of students sat their finals exams in May and June 2008, an exciting milestone for the school. The exams were a huge success with the school finishing in the Top 5 in all of Gambia, and many of the first wave of students have attained admission to University. The school sits in a large walled compound with a number of buildings. The school has 12 classrooms, a laboratory, and IT training classroom, a meeting hall and an administration suite. The school has its own water well and is now getting a dedicated 24-hour supply of electricity. Outside, there are facilities for football and track athletics. In additional developments, the capacity of the school is being doubled, and new facilities are also being planned such as a science laboratory equipped with specialist equipment, chemicals and specimens. Students also have plots for agricultural experiments which has proven very successful.